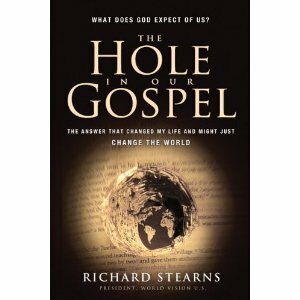 Wes Ellis: "The Hole in our Gospel"
It's called The Hole in Our Gospel by Richard Sterns (President of World Vision) and I think it represents the trend that I've noticed, that Social Justice is becoming more and more acknowledged as an essential element of Jesus' gospel by evangelical Christians. Sterns has found a way to appeal to perhaps the widest spectrum of people I've seen. In the first couple of pages, as is common with books like this, there is a list of endorsements written by people with credibility. What is uncommon is the diversity of people who like this book. Sterns has everyone from Madeline Albright to Bono to Chuck Colson to Jim Wallis and Tony Campolo. I'm surprised that Chuck Smith and Brian McLaren aren't listed beside one another! He quotes people like John MacArthur and D.L. Moody along with Jim Wallis and N.T. Wright. If you know me, you know I'm huge into building bridges. I love to see different kinds of people discover common ground and stand together. Well Sterns, if he's done nothing else with this book, has built a few bridges. I can only speak to the first 6 chapters, since that's how far I've gotten, but the book is truly challenging and well thought out! Sterns carefully articulates the wholeness of the gospel and the call for Christ's victory to change more than just the geographical (or trans-geographical) destination of our souls. As he puts it, "the gospel means much more than the salvation of individuals. It means a social revolution" (page 20). He points out that our mission is to be that of Christ. What Christ is about, we should be about. What God cares about, we should care about. This means a genuine and deep love for the poor and the oppressed. He points out the Biblical mandate that "any system, law, or practice that is unjust must be broken--whether personal, social, political or economic... Charity, equity, and mercy are the marks of the kingdom of the Messiah, and Christ wanted it to begin on earth" (page 56-57). And somehow, he's able to say all this without being "liberal" (although some, I'm sure, will still label him as such). I am so grateful for this book because it's something that says the things I am (or at least aspire to be) passionate about and I can still recommend it to my regular church friends.